Yangchen is a delightful young girl from the Kyirong county in Southern Tibet, near the Nepali border. Her beautiful long hair is braided and tied with pretty ribbons. 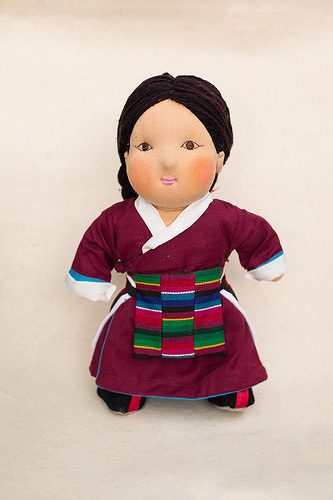 She wears a long, typically maroon chupa (Tibetan dress) with a white shirt. Like most girls from her region she enhances her outfit with a unique colourful back apron as well as the vibrant more common striped front apron. Thick felt boots are a must to keep herself warm in that harsh mountain climate.